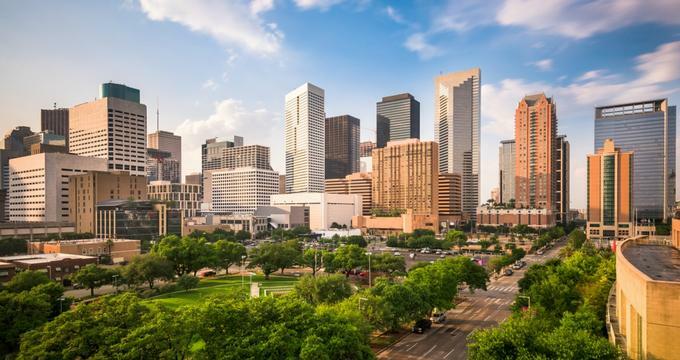 As the fourth-largest city in the United States, Houston has no shortage of things to see and do. Whether you're visiting on business or pleasure, it's worth making time to check out some of the city's award-winning restaurants, boutique shops, and lively bars. No matter what you decide to do during your time here, these Houston inns and hotels will make sure you have the best possible trip. Located in the heart of Houston, Hotel Alessandra is a newly renovated modern, upscale hotel snuggled within the Green Street Commercial Complex. Only a short walk from Market Square Park and Toyota Center, the hotel’s 21 floors feature elegant rooms and suites decorated in a sophisticated art deco style, with free Wi-Fi, flat-screen TVs, iPod docking stations, and minibars. Many upgraded rooms have stunning city views and sofas, while suites have living rooms, free-standing tubs, and wet bars. The hotel has a gym, a spa, an outdoor pool, and a business center. Guests enjoy a free car service within the city center. The hotel restaurant offers French, American, and Mediterranean cuisine. 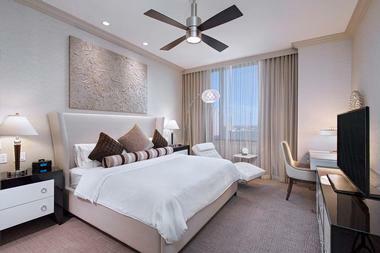 One of Houston's most unique boutique hotels, Hotel ZaZa Houston Museum District is located near some of the best shopping, art galleries, and museums in the city. There is a wide range of accommodations options for guests to choose from, including poolside bungalows and concept suites. Each floor of the hotel has a pantry with complimentary coffee and tea; guests are also welcome to enjoy a drink at the poolside bar or head to the hotel restaurant for steak, seafood, or weekend brunch. Free bicycle rentals are offered to guests, and a shuttle service to nearby destinations is available as well. Hidden away on 18 acres of forested land, the Houstonian Houston Hotel offers a full-service resort experience only minutes away from downtown Houston. 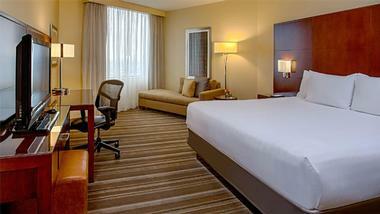 All rooms come with flat-screen TVs and floor-to-ceiling windows with views of the trees. The serene spa is an excellent place to relax and unwind, while the basketball court, rock climbing wall, tennis courts, boxing ring, and well-equipped exercise center make it easy to fit some exercise into your schedule. There are also three large pools and a hot tub for guests to enjoy, and on-site dining options include a fine dining restaurant and a poolside grill. 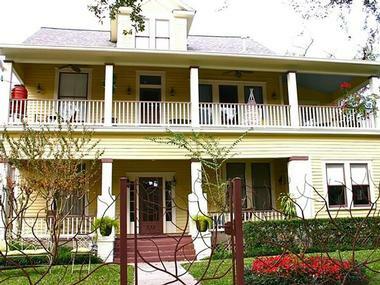 Offering seven elegant rooms, La Maison In Midtown is an upscale bed and breakfast that provides a calm oasis right in the heart of Houston. The rooms and suites are each decorated in their own unique styles; all are accessible by elevator and include amenities like whirlpool tubs, flat-screen TVs, or even private wraparound verandas. Guests are welcome to make use of the parlor, living room, and formal dining room, and a delicious breakfast is served every morning in the airy French kitchen. Free parking is available, and the hotel is within walking distance of some of the city's best restaurants and entertainment venues. The Lancaster Hotel has been a prominent feature in the Houston theater district since it was constructed in 1926, and it prides itself on providing a boutique European-style hotel experience. 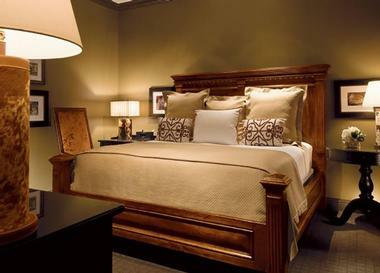 The elegant rooms and suites boast marble bathrooms and antique beds, and they also include modern amenities like free Wi-Fi, coffeemakers, and mini-fridges. A hot buffet breakfast is included in the room rate, and the hotel also offers a complimentary wine night once a week. Parking is available for a fee, and guests are free to use the complimentary shuttle service to get anywhere within a three-block radius of the hotel. Located inside the Town and Country Mall, Hotel Sorella CITYCENTRE offers contemporary rooms and suites with minibars, flat-screen TVs, floor-to-ceiling windows, and free Wi-Fi. Plenty of excellent shops, restaurants, and bars are only steps away, but the hotel also offers a complimentary shuttle service to destinations within an 8-mile radius. A continental breakfast is offered free of charge, and an outdoor poolside restaurant is open for lunch, dinner, and snacks throughout the day. Other hotel amenities include a spa, a fitness center, doorman and bellboy services, and a trendy bar that often hosts live music. Built in the style of a grand Italian villa, the Hotel Granduca Houston is a luxurious little piece of Italy hidden away in the heart of the city. The on-site restaurant specializes in modern twists on traditional Italian cuisine, and poolside dining is available in the beautiful outdoor garden. All rooms come with views of either the garden or the pool, and suites include luxurious features such as soaking tubs and full-size balconies. A Granduca Maserati is available to take guests to nearby destinations, and live music is played in the bar every night from Thursday through Sunday. 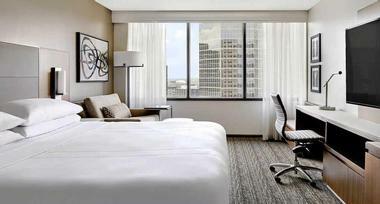 Set inside a skyscraper built in 1910, the JW Marriott Downtown Houston is only a 5-minute drive away from the Discovery Green and the Toyota Center. The contemporary rooms are all furnished with personal iPads, flat-screen TVs, and Nespresso coffee machines, and some include whirlpool tubs, full kitchens, living rooms, and access to a lounge with complimentary food. On-site dining options include a restaurant with a seasonally inspired menu and an elegant cocktail lounge, and other hotel amenities include a luxurious full-service spa, a fitness center, and a yoga studio that welcomes practitioners of all levels. Originally constructed in 1911 to serve as the Union National Bank, Hotel Icon has managed to preserve and display some of its rich history in the form of a large bank vault door behind the front desk and intricate period detailing throughout the building. 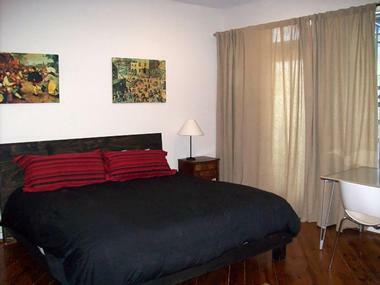 The rooms, however, boast modern amenities like free Wi-Fi, iPod docking stations, and large flat-screen TVs. The hotel restaurant serves locally sourced Texan cuisine for breakfast, lunch, and dinner, and other amenities include a luxurious spa, a 24-hour exercise center, and a complimentary car service available to bring guests to any downtown destination. Situated in the downtown historic area of Houston, the Magnolia Hotel is housed inside an elegant landmark building that dates back to 1926. The hotel has undergone extensive renovations over the years, and the rooms now include modern touches like free Wi-Fi, coffeemakers, and flat-screen TVs. Guests are also welcome to relax in the billiards room, the plush restaurant and lounge, or in the rooftop pool and hot tub, which boast fantastic views of the city. Complimentary milk and cookies are offered to guests every evening, and a local car service is available free of charge. Catering to visitors looking for a taste of true Texan luxury, the St. Regis Houston is a five-star establishment with a full-service spa, a large outdoor swimming pool, and a tea lounge that serves afternoon tea. The rooms boast custom furnishings, Italian linens, and views of either the city or the park; upgraded suites also offer whirlpool tubs and butler service to assist with everything from morning coffee delivery to shoeshine services. There is an intimate wine room that can be rented out for private events, and the swanky hotel bar hosts live music every Friday and Saturday night. Conveniently located in downtown Houston, the Best Western Plus Downtown Inn & Suites offers spacious, comfortable rooms at wallet-friendly prices. The rooms are simple but well-equipped; they come with Wi-Fi, fridges, microwaves, coffeemakers, pillowtop mattresses, and cable TV. A complimentary hot breakfast with tea and coffee is available every morning, and the hotel is also happy to offer a complimentary happy hour with beer, wine, and hors d'oeuvres every weekday. Other perks and amenities include a free weekday shuttle, an outdoor pool and hot tub area, on-site parking, and a 24-hour business center with meeting rooms. 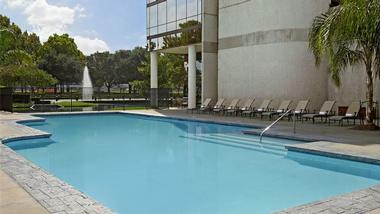 Established in 1963, the Whitehall Houston is ideally located for anyone who wants to explore downtown Houston. Plenty of wonderful shops and restaurants can be found within easy walking distance of the hotel, but guests can also enjoy a meal at one of the hotel's three restaurants. The rooms feature free Wi-Fi, desks with comfortable chairs, and flat-screen TVs with premium cable channels, and the hotel boasts a beautiful rooftop pool with cabanas and a sundeck. Valet parking is available, and the hotel offers a complimentary shuttle service to any destination in the downtown core. 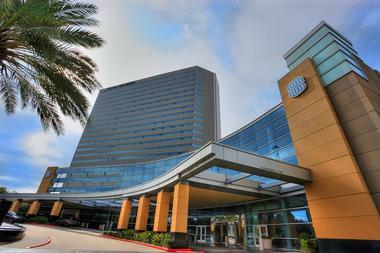 One of the most popular hotels in the Museum District, the Houston Marriott Medical Center/Museum District is connected to the Texas Medical Center by a covered walkway. All rooms come with a sitting area and a marble bathroom, and upgraded rooms include a continental breakfast and access to a lounge with complimentary evening appetizers. Complimentary towels are provided for the heated indoor pool; guests are also welcome to make use of the hot tub and the well-equipped fitness center. The hotel restaurant serves up hearty Texan fare, while the on-site lounge offers light meals and a full beverage menu. 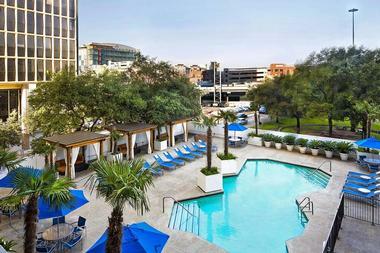 As one of the few AAA Four Diamond rated hotels in the city, the Royal Sonesta Hotel Houston offers the perfect blend of modern luxury and Southern hospitality. The hotel caters to business and pleasure travelers alike, but business guests will especially appreciate the free in-room Wi-Fi, the 24-hour business center, and the convenient fax and photocopy service. The hotel's 485 rooms are all equipped with flat-screen TVs, mini-fridges, and coffeemakers, and some offer whirlpool tubs. Other amenities include an upscale restaurant, a cocktail lounge, an outdoor pool, a 24-hour gym, and a free local shuttle service. Situated in the city's entertainment district, the Hyatt House Houston/Galleria is designed to meet the needs of anyone planning a long-term stay in the Galleria area. The suites all include full kitchens, living areas, and free Wi-Fi; some also feature walk-in closets and multiple bedrooms. A complimentary buffet breakfast is available every morning, and a grocery shopping service is provided for guests free of charge. The hotel also offers a casual lounge, a 24/7 convenience store stocked with snacks and toiletries, an outdoor pool with a hot tub, and a well-equipped fitness center. Located right across the street from the Houston Galleria, the largest shopping center in Texas, the JW Marriott Houston provides a luxurious place to relax and unwind after a long day of shopping. The contemporary rooms boast thoughtful touches like featherbed mattresses, elegant bathrooms with complimentary robes and slippers, and ergonomic work spaces with excellent lighting; some offer beautiful views of the city skyline. Upgraded rooms come with access to an exclusive lounge serving complimentary breakfast and evening appetizers, and guests can also enjoy a delicious meal of regional Texan cuisine at the hotel's signature restaurant. 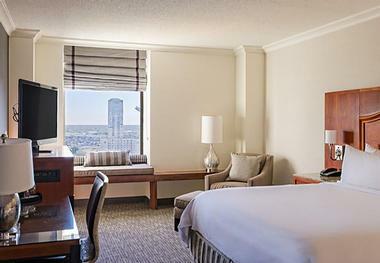 Nestled in the heart of Houston, the Hyatt Regency Houston is a AAA four diamond hotel that welcomes everyone from business travelers to families on vacation. Amenities include a rooftop pool and a 24-hour fitness center, and the sleek rooms all include free Wi-Fi, flat-screen TVs, and iPod docks. Guests of the hotel will be pleased to find themselves only a short walk away from the Hobby Center for the Performing Arts and a selection of excellent restaurants, but they can also enjoy a meal in the 34th-floor restaurant, which boasts the first revolving dining room in Houston. Offering an excellent selection of comfortable rooms and suites, the Westin Houston Downtown can be found across the road from Minute Maid Park. The air-conditioned rooms feature flat-screen TVs and pillowtop mattresses, and some offer pull-out sofa beds, wet bars, and views of the ballpark. Guests are also welcome to enjoy the well-equipped fitness center, the complimentary shuttle service to downtown locations, and the baseball-themed restaurant in the lobby, which is open for breakfast, lunch, and dinner. Dogs can be accommodated for a fee, and the hotel is happy to offer them beds, treats, and toys. Guests are greeted with a peaceful water feature as soon as they step through the front door of the Omni Houston Hotel at Westside, and this beautiful tranquility continues all throughout the rest of the hotel. The rooms come with plush bathrobes, pillowtop mattresses, and an optional turn-down service, and hotel amenities include a heated swimming pool and whirlpool, an elegant wood-paneled bar, a full-service restaurant on the edge of the indoor water feature, and a cafe that serves specialty coffee and freshly baked goods. Parking is available free of charge, and a complimentary shuttle service is offered to nearby locations. 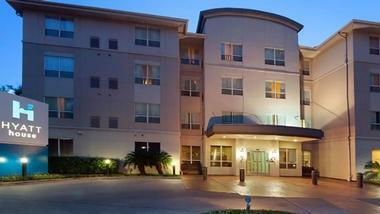 Five miles away from downtown Houston, Modern B & B offers comfortable rooms with iPod docks and flat-screen TVs. 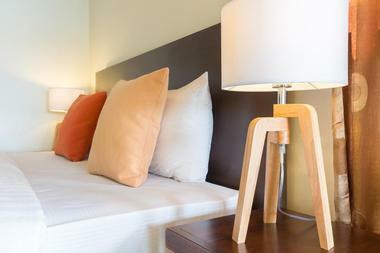 Free Wi-Fi is available, and a gourmet breakfast made with organic ingredients is included in the room rate. Guests are also welcome to use the communal kitchen, which features a high-end espresso machine and is open 24/7. Four parking spots are available, and other amenities include a fitness center and a guest office space. The property can also be used to host special events, and customizable packages of flowers, candy, and wine can be added on to the room rate.